Commercial Treadmill Diamond – 31 manufacturer heavy duty rollers and high tech advanced cushioning and deck thickness with wax-coated for long lasting life. Commercial Treadmill Diamond – 31 having shock absorbers in front deck. 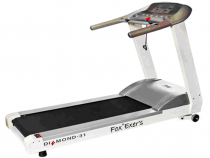 This model is one of finest quality manufacturer commercial Treadmill Diamond – 31 with low maintenance and well-designed which help to reduce the knee joints for walker. MFFD (Multi Function Fluorescent Display). Dot matrix + 4 LED windows display. Once touch button for Speed & Incline. Running Belt : 20" x 58"
4 pre-set programs, total 33 programs, including user model.